Last month, we saw a render of the Moto Z2 Play is Crown Gold color, and now we have a render of the Lunar grey color variant of the same Z2 Play along with its Style Mods. 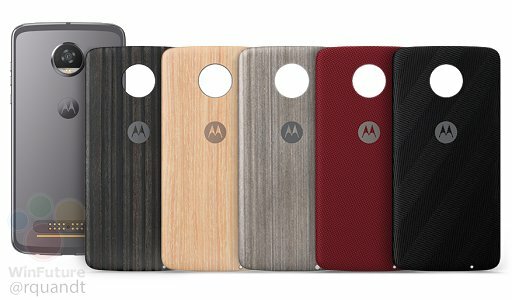 As seen with the Moto Z Play, the Z2 Play will also get style mods in five colors. The Moto Z2 Play won't feature drastic changes from the Moto Z Play because Motorola promised that the Moto Mods will fit their devices for the next two years. Not only in the form of design, the device won't feature any drastic hardware changes as well. The phone will feature the same 5.5-inch display with increased brightness levels. The Snapdragon 626 will power the phone, but this time around there will be 4GB of RAM and 64GB onboard storage. The Z2 Play will use the same camera sensor as the Moto G5 Plus along with 5MP front-facing camera with dual tone LED flash. The battery size may also be trimmed down to 3000mAh, which will be a huge downgrade.